This game has hidden bonus content. Quite a few unused animations for Sonic in Sonic World, including some from Sonic 3D's special stages. Sonic 2 mistakenly uses Sonic 1's invincibility theme, but the correct one is still on the disc (as a 3-part AIF file). 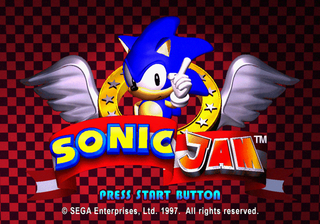 Sonic Jam is a compilation of the four Genesis Sonic titles (Sonic 1, Sonic 2, Sonic 3, and Sonic & Knuckles) plus bonus content in the form of Sonic World (the precursor to Sonic Adventure) and a number of different gameplay options. Specifically: How do you "glitch through the wall", and why isn't it on a Bugs page yet? Behind the waterfall of Sonic World is a piece of sidewalk that can be seen by fiddling with the camera. It's possible to glitch through the wall via jumping through the waterfall by a certain angle, but why is it there...? Any way to enable these with hacking or cheat device codes? 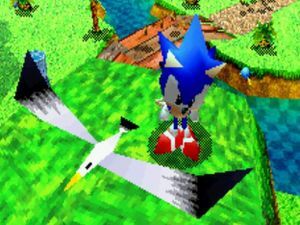 In the code of the game, there are some unused animations for Sonic, most of them reflecting the same animations used for Sonic in Sonic Adventure. A short, repetitive music loop. Some kind of honking sound effect. 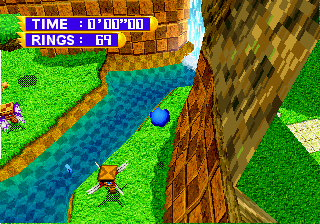 The Sonic World engine has a number of unused objects, most of which are null. However, two of them still somewhat function and have models. A monkey that walks in place. You can walk through it and he does nothing else. Probably meant to be in a tree. A seagull that just sits in place. Probably meant to be in the sky. You can walk through it too. These can be found by inserting the disc into a computer's CD-ROM drive and looking in the /Extra directory. This page was last modified on 20 December 2018, at 14:43.